Globally, two billion people cannot access the medicines they need, with millions in low- and middle-income countries dying each year from diseases because the vaccines, medicines and diagnostic tests that they need are either ineffective or completely lacking. Diseases can have an effective cure available and still face product gaps – such as syphilis, where the development of a single-dose oral treatment would enable governments to bring this disease quickly under control during outbreaks. The WHO and Policy Cures Research, an independent R&D-focused policy group, have published lists of the most urgently needed new products – here termed priority product gaps. Without action by large research-based pharmaceutical companies, there is little chance that these products will be developed and commercialised. 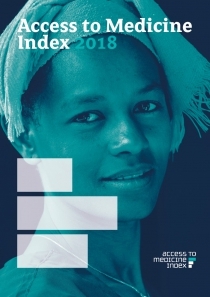 The 2018 Access to Medicine Index looks at which of these gaps are being addressed by the 20 companies evaluated and whether the companies are developing products that are urgently needed by people living in low- and middle-income countries. What is a priority product gap? A medicine, vaccine, diagnostic or other product that does not exist but is urgently needed by people living in low- and middle-income countries. The 20 companies are developing 1,314 R&D projects for the 77 diseases, conditions and pathogens covered by the Index. One fifth of these (23%) target a priority product gap. There is no published list of R&D priorities for non-communicable diseases as yet. Five companies are developing the majority of these projects. Overall, 63% of these projects sit in the pipelines of GSK, Johnson & Johnson, Sanofi, Merck KGaA and Novartis. When it comes to priority R&D, most companies focus on communicable disease priorities, mainly HIV/ AIDS, malaria and tuberculosis, as well as some neglected tropical diseases. Only three companies are conducting priority R&D for maternal & neonatal health conditions: GSK, Merck & Co., Inc and Pfizer. Priorities have been identified for 45 diseases. However, half of the 298 projects that target these priorities target just five diseases: HIV/AIDS, malaria and tuberculosis (TB) and two neglected tropical diseases, Chagas disease and leishmaniasis. WHO estimates that malaria, HIV/AIDS and tuberculosis accounted for more than 3 million deaths in 2016. The Index has broken down the 298 projects for R&D priorities to see how they are spread out. Out of the 45 diseases flagged as a priority, 33 have at least some projects in the pipeline. However, the average number of projects per target is 2. Out of 45 diseases flagged as a priority, 13 have empty pipelines in this analysis. ** 'Other prioritised antibiotic-resistant bacterial infections' covers 12 antibiotic-resistant priority pathogens identified by WHO for which new treatments are urgently needed. Tuberculosis is assessed separately. Which types of product gap are being addressed? Some of the priority product gaps are for urgently needed new medicines, whereas others are for vaccines or for new diagnostic tools. The Index looked to see whether certain types of products are being developed in greater numbers. It found that preventive vaccines and medicines get roughly equal attention. Around half of the gaps for new medicines or vaccines are being addressed. Diagnostics, however, get the least attention, despite there being a similar number of priority gaps. Many companies in scope have expertise in diagnostics and could offer much in this area. 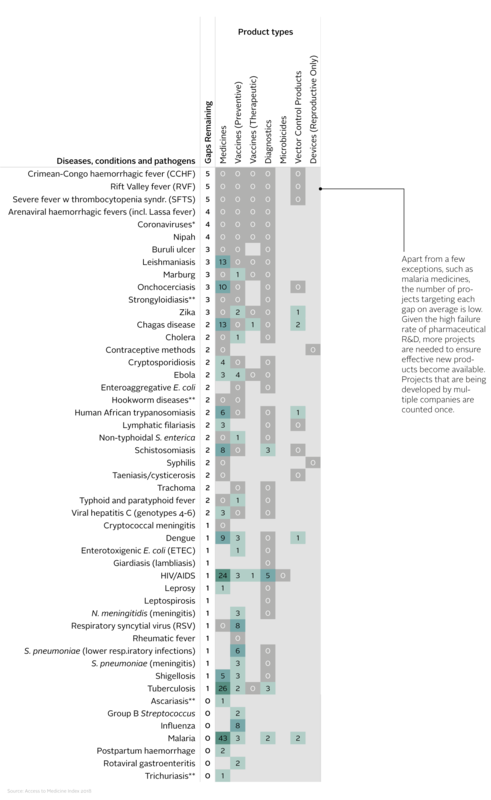 Looking across all 45 diseases, there are 139 priority product gaps. The heatmap shows how many product gaps have been flagged per disease, and whether there is anything in the pipeline. For the majority of these diseases, one or more product gaps are not being addressed by this group. That means many much-needed medicines, vaccines and diagnostics are likely not being developed, unless they are in early stages of development by, for example academic research groups or others in the private sector, especially small biotechnology companies. Figure: Heat map showing which product types are flagged as priority gaps, per disease, and how many projects target each gap. Most priority R&D projects are being conducted by five companies: GSK, Johnson & Johnson, Merck KGaA, Novartis and Sanofi.